“I am honored for the opportunity to re-introduce the mural to the community,” said mural artist Solomon Thurman, who shared his story about the history and the making of the mural with a large audience at Lambert-St. Louis International Airport on February 16. 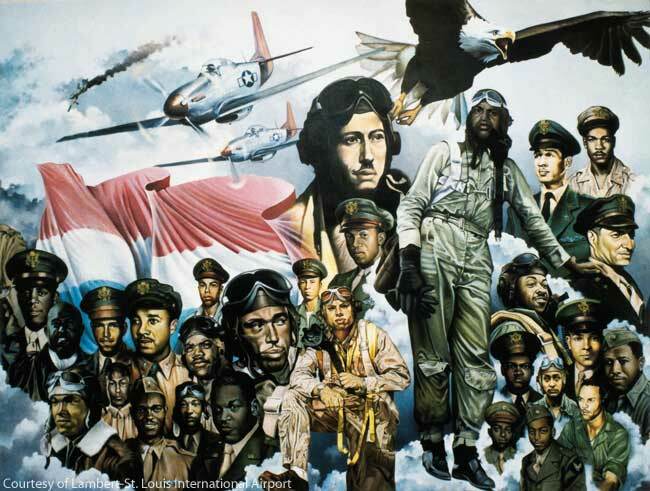 The 51-foot long mural in Lambert’s Terminal 1 Bag Claim is one of the largest paintings honoring the Tuskegee Airmen. ‘Black Americans in Flight,’ painted by Thurman and the late Spencer Taylor, was originally dedicated in 1990. Lambert recently restored the mural and renovated the area around the 22-year old painting, which includes a new passenger waiting area at the exit of the C Concourse in Terminal 1. Artists Thurman and Taylor were both McDonnell Douglas employees when the mural was commissioned by a local committee called Aviation Mural Project Success (CAMPS), in the late 1980s. CAMPS was led by the late Vesta Pruitt. Her two daughters joined dozens of others at the re-dedication event to share the importance of the mural. “Let us ensure that the courage and bravery of the Black aviators who inspired this mural continue to inspire each of us today and tomorrow. The legacy continues,” said Crystal Pruitt. McDonnell Douglas, Anheuser-Busch and many other local companies and individual mural supporters funded the campaign. During the re-dedication, Solomon Thurman presented a print of an original painting that will now be part of the ‘Black Americans in Flight’ mural exhibit. The art piece captures Spencer Taylor as he painted one of the 75 individual portraits in the mural. There are also 18 aircraft illustrated in the four-panel painting.Taylor was a senior industrial artist with McDonnell Douglas (now Boeing), which sits on the north side of Lambert’s airfield. Thurman was a senior re-production equipment technician for the aerospace company. He now owns the 10thstreet Gallery in St. Louis with his wife, Pat, and continues to paint and exhibit his works of art. Earlier in the day, Thurman shared more of his stories behind the “Black Americans in Flight” mural with 100 area high school students. 89-year-old Tuskegee Airman Christopher Newman, who is depicted in the mural, also spoke to students and was part of re-dedication event. Newman was part of 84 missions as a fighter pilot in WWII. His plane was shot down over the Adriatic Sea, where he was rescued six hours later. Victor Reef, who is in the photo, was one of my professors in engineering school. Though I am a “white boy,” Reef was responsible for making me a scholar, getting me a scholarship to complete my education, and drawing me into teaching, which I am still doing. I think he ran the ground school for the Tuskegee Airmen. But he never once said anything about it. He was modest but not shy. I would like to know more about his role with the Airmen. I owe him a lot. Is there anyone who has memories of him in the 332nd, who would be willing to share with me?